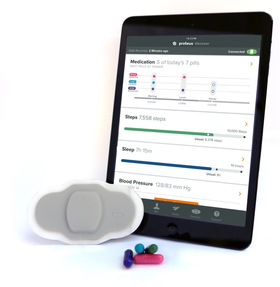 Proteus Discover uses an ingestible sensor, a wearable patch and a software application to track medication adherence. Proteus, a Redwood City, Calif.-based “smart-pill” startup, sees promise for its adherence sensor in cardiometabolic drugs. The company presented preliminary results Monday during the annual American College of Cardiology meeting that show when combined with drugs used to treat hypertension and comorbidities, the technology showed better outcomes than traditional treatments for patients with uncontrolled hypertension and type 2 diabetes. The technology, called Proteus Discover, uses an ingestible sensor, a wearable patch and a software application to track medication adherence. By week four, 85% of patients using the Proteus-drug combination reached their blood pressure targets of less than 140/90 mmHg. Only 33% of patients on the usual care path were able to reach this goal in the same time frame. The subjects were treated with a selection of seven commonly prescribed medications for hypertension, high cholesterol and diabetes. The study, which lasted four or 12 weeks depending on the patient, was conducted on 96 patients with uncontrolled hypertension and type 2 diabetes who were not successfully treated with least two anti-hypertensive medications plus metformin and/or sulfonylurea. When a medication embedded with the Proteus sensor reaches the stomach, the sensor sends a signal to the patient's bandage-like patch, which records and time-stamps the information along with other metrics such as rest and activity patterns, and sends it to the application on an individual's phone. That information can also be shared with a physician. Proteus recently announced a deal with Tokyo-based Otsuka Pharmaceutical Co. to embed the sensor in schizophrenia drug Abilify, which would be the first FDA-approved medication that would carry an ingestible sensor, if the pending application is approved by the agency. For now, Proteus is combined in a capsule with medicine by specialty pharmacists, including for high-value drugs like hepatitis C treatments. Savage said he expects a development on the Abilify application "within the next month or so." The company has a number of new drug applications underway for cardiometabolic drugs, including lisinopril and metformin, according to Chief Medical Officer George Savage. Those drugs are used to treat comorbid hypertension, which Savage said the company chose to focus on next because of it is “a global epidemic,” he said. Unlike the Abilify deal, Proteus is the sole sponsor of these new drug applications, where the pharmaceutical ingredients are generic. However, going forward, the company doesn't expect to file applications for a vast amount of medicines on its own, Savage said, but rather offer Proteus as a “platform” through licensing. Regardless of condition or geography, adherence for long-term therapies for chronic illnesses averages 50% in developed countries, and even lower in developing nations, according to the World Health Organization. Non-adherence costs the nation $100 billion to $300 billion in avoidable healthcare costs because poor adherence escalates the need for treatment and adds other indirect costs, according to a 2014 article in the journal Risk Management and Healthcare Policy. Those figures represent 3% to 10% of all U.S. healthcare costs.